This review first appeared in the July 10, 1992 issue of the North County Blade-Citizen (now North County Times). 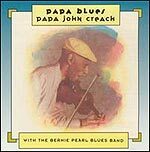 Papa John Creach is a walking encyclopedia of American indigenous music  blues, jazz, country/western, he's played it all. Oddly, his greatest fame (not to mention fortune) has come from his long membership in and/or association with the rock bands Jefferson Airplane, Jefferson Starship, Hot Tuna and the Charlie Daniels Band. This, his first album in over a decade, features him in a contemporary blues setting, backed by Southern California's Bernie Pearl Blues Band. One of the things that makes this album so listenable and appealing is that Creach, like blues pianist Champion Jack Dupree did with his last two albums, refused to allow this project to bog down into a retrospective of his life. He doesn't touch on every style he's mastered, nor does he simply play a bunch of old-time hits. Instead of wallowing in nostalgia, Creach is still, at age 75, looking to the future with a dynamic set of electric blues. All but two of the songs here are originals, and only one of the covers can rightfully be called a classic ("Baby Please Don't Go"). Too, Creach changes gear here by turning in vocals on almost every cut, something he hasn't been known for in his live performances since the mid-'50s. His singing style is low-key and the good Lord knows Creach doesn't have the best voice in the world, but his sense of timing is still impeccable, and on whole, Creach singing the blues achieves a sense of rightness. Creach's violin playing has given little quarter to age. To listen to the nimbleness of his fingerwork, one would never guess that much of the rest of his body is bent with arthritis. His famous quivering glissandos are still present, as is are the imaginative improvisational solos. The Bernie Pearl Blues Band is a tight combo, with saxophonist Hollis Gilmore deserving special kudos. This band ought to be putting out an album on their own, so good are they. While Creach hasn't recorded much of late  only this album and a three-song guest appearance on Jeannie and Jimmy Cheatham's "Back to the Neighborhood" in 1989 over the last decade  he is still in his musical prime, and we can only hope this is the beginning of a long period of recording work for him.